The overall strategy for the first south Atlantic section of the Volvo Ocean Race's sixth leg north to Newport, Rhode Island has been about when to put in 'the big tack'. The south Atlantic part is largely upwind and across the fleet the tactic was to sail into the west side of the St Helena high - fortunately reasonably well placed to undertake this manoeouvre - and to then tack out on a lift. The 'big tack' occurred on Friday morning UTC and its timing has had significant long term effects such as the positioning of the fleet laterally across the race track, the boat's relative apparent wind angles and ultimately how good their progress has been north. Either bravely 'doing their own thing' or simply ending up in this position - Team Alvimedica began their starboard tack leg north some 27 miles to the west of the majority of the fleet. Conversely Team SCA and Team Brunel set up on the right, easterly side of the course with Dongfeng Race Team leading Abu Dhabi Ocean Racing and MAPFRE on the west side of the main group. At this point we should give credit to Team SCA which are the time of the tack was probably leading in real terms (ie with regard to the short term wind angle rather than DTF), a great performance by Sam Davies' crew. Mid-morning on Friday Team SCA was furthest north in the 'group' however by lunchtime, Dongfeng Race Team, just five miles off to port had pulled ahead. As Team SCA and Brunel cracked off a little in the afternoon, they regained the northerly spot and this starboard tack drag race - some 680 miles to Natal - has continued for the duration of the weekend, the boats cutting across the northeasterly trades with Dongfeng Race Team very very slowly edging ahead. 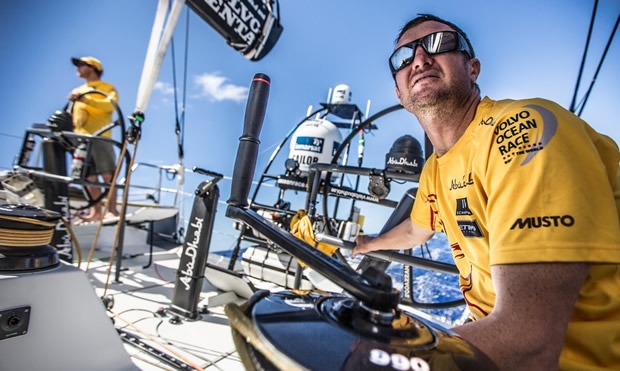 By 0000 Sunday Dongfeng Race Team was leading the easterly group by some four miles and had been making better progress than Team Alvimedica out to the west while overall VOR race leader, Abu Dhabi Ocean Racing found itself in the unfamiliar position of bringing up the rear. Over the course of yesterday morning Team Brunel fell in astern of Dongfeng followed by MAPFRE and Team SCA with Team Alvimedica some 11 miles off the lead in terms of DTF and Abu Dhabi OR 16.6 off the pace. Closing once again on the Brazilian coast, Dongfeng Race Team passed Recife at around 1600 UTC on Sunday, some 48 miles offshore, with MAPFRE and Team Brunel jockeying for second some eight miles behind the Franco-Chinese team and Team SCA a further nine miles back with ADOR and Team Alvimedica some two knots slower due to having to sail higher, drawing level with Recife two hours later with Charlie Enright's team 25 miles offshore. Overnight the boats turned on to a more due north heading, sailing parallel with the Brazilian coast, helped by the wind veering into the southeast and holding at around 13-14 knots. However since passing Natal, at the northerly point of the easterly bulge in the Brazilian coastline, this morning so the boats are now free to sail the direct course towards the finish line, albeit still some 3,500 miles away. From here, by being so far west, the boats are unlikely to encounter too much by way of Doldrums with the satellite wind radar images showing the transition from southeasterlies to northeasterlies occuring at around 2°S. Once across the Equator it will be a prolonged beam reach across the Trade winds which will provide a lively ride for the relatively tender VO65s (compared to their VO70 forebears). The Bible says that God "rested on the seventh day." Well, the fact is here there is no rest on the Lord's day. The day has been very stable for us and we have been able to maintain the speed of the boat and our course in the routing. Dongfeng is sailing so fast that they have been taking around half mile on each watch (ie. every 4 hours). All of this is a bit desperate and a bit frustrating since we do not know why and how they always have that extra speed. Is it the mast? Do they have a new mainsail? Here are some questions that the crew is asking. It was pretty funny to see how, gradually, Brunel approached from the horizon. During the night they overtook our boat. Something similar happened with the girls, who maintained their course overnight and then crossed our stern. We have perfect weather conditions with almost 14 knots and fairly dry winds that make life onboard pretty enjoyable; in fact we can have all the windows open (because at midday heat is very strong).